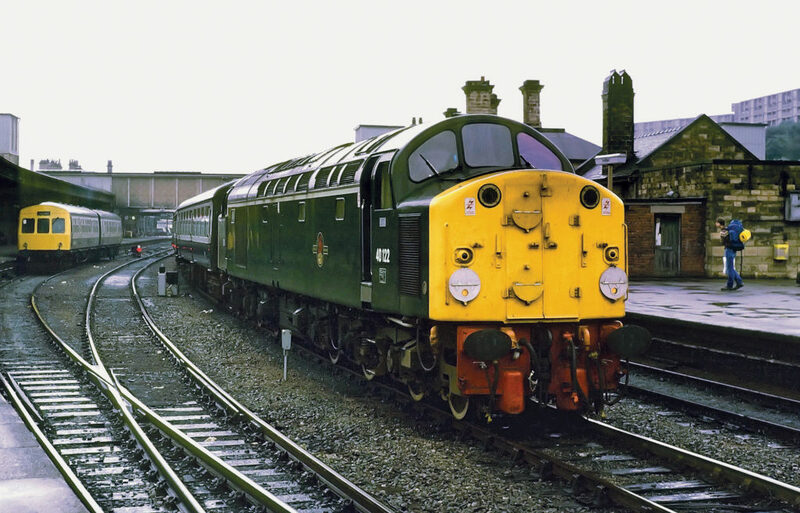 There was a time when, as a novice train spotter in the mid-70s, I was not quite able to distinguish between the various types of diesel locomotive found on the BR network. My brother John had recently purchased an Ian Allan ‘Locoshed’ book, the 1976 edition, and we had pored over the lists of numbers, wondering when we might see examples of each particular class of engine. We soon realised that certain classes of locomotive were, at that time, allocated to depots on a regional basis. So for example, to see a Class 26 or 27 one had to go north, to Haymarket or Eastfield, whereas to see a Class 33 one had to go south, to Hither Green or Stewarts Lane. This accounted for the fact that these locomotives never put in an appearance on our regular visits to Leeds, Sheffield or York, our regular spotting haunts then. Early on though, we began to see plenty of Type 4s. We did not know they were Type 4s at that time, as the objective was simply to discover if we’d seen something new and to tick it off in the book. I well recall the time on one of the very first visits to Leeds, when looking at a Class 40 in profile, that I suddenly realised it had an ‘extra’ pair of wheels compared with the similar-looking Class 37s. 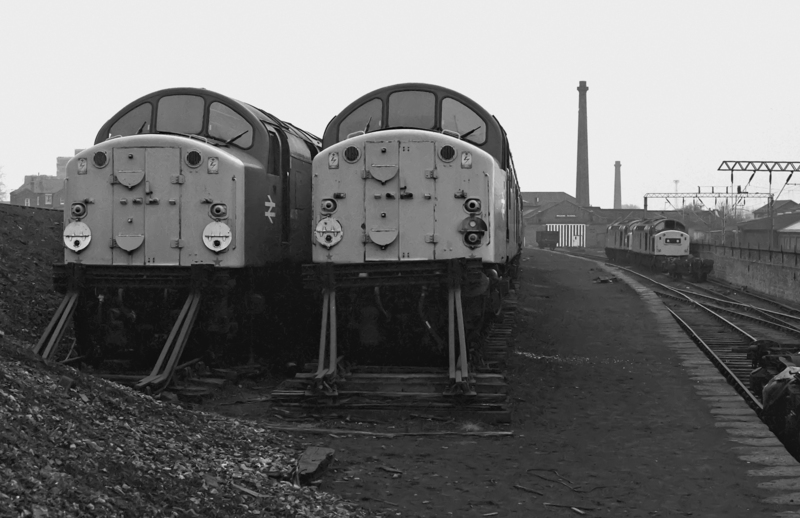 It may have been on the same day that I saw a Class 45 for the first time and noted that it had the same wheel arrangement as the Class 40, but although superficially similar in appearance, with the three cab windows and the protruding nose, there were some differences – the large body side grilles, a slightly flatter and shallower bonnet. If you are interested in something, it doesn’t take long to become knowledgeable about the subject. Those early experiences of trying to figure out what made a ‘45’ different from a ‘46’, and realising that a ‘40’ had more wheels than a ‘37’ seemed to last mere days – and perhaps they did. The nature of the discovery evolved into a more focused process – more like a quest I suppose. Finding out that a Stratford-based Class 47 might appear on a passenger turn at Sheffield led to routine heightened anticipation on visits there. Likewise, it was always a bit of an event when one of the Western Region’s named 47s, perhaps ‘Odin’, or ‘Cyclops’ turned up. The 46s contrived to make themselves slightly more interesting than the 45s, largely because there were fewer of them in service, but then the 45s provided a counter-balance because many of them were named, and that always added a new dimension which the 46s could not offer (with the exception of the mysteriously singular 46026). So it did not seem to take very long to start to mentally categorise the various classes and the individuals therein, to a kind of hierarchy of interest, much of which was based on rarity, actual or perceived. This has probably always been an intrinsic aspect of any ‘spotting’ hobby, whether it be trains or birds. To a Yorkshire-based enthusiast with limited travelling capability, a Western Region 47 from Old Oak Common was always going to rank above say, a Knottingley-based classmate. No doubt if I’d lived in Devon it would have been otherwise. The 47s were always up against it, so to speak, in desirability terms. ‘Just another Brush 4’ was an oft-heard remark, understandably so when they outnumbered all other Type 4s by a substantial margin. Not only that, but the 47s did not even offer the differentiation factor that the 40s and Peaks achieved by having a range of headcode panel configurations. 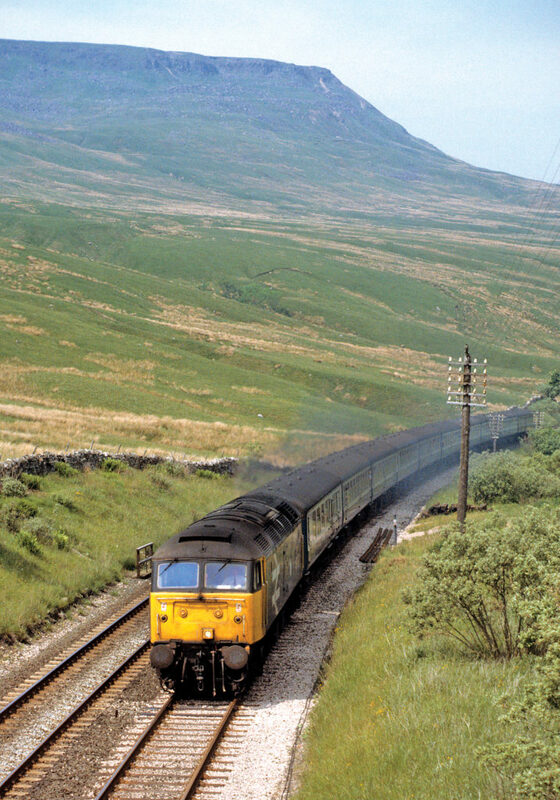 Until their conversion to uniform sealed-beam marker lights, the Peaks offered four possibilities in this respect – if one includes the original discs of the Class 44s. The ‘split headcode’ Peaks were perhaps not the most aesthetically pleasing, but the two central headcode types, a singular panel or two square-ish adjacent panels, looked nicely balanced. An early revelation concerned the Class 40s. Pictures of some of these locomotives in the railway magazines would say, for example, ‘…40013, formerly ‘Andania’…’ and it became apparent that a sizeable contingent of the class had once been named but at some point the nameplates had been removed – every single one of them. Then I spotted the bolt-heads on the side of 40020 at Leeds, and on 40012 at Sheffield, and realised that these marked the spot. I read in several magazines and books that a decision had been made by BR to remove the nameplates, but there was never really a satisfactory explanation, nor was any responsible individual ever identified. I read that the motivation was to do with corporate uniformity, or perhaps that the 40s were no longer seen as top-link motive power and therefore unworthy of carrying names, but these seem very weak arguments. Why not just leave the plates where they were? There were no operational or reputational implications. Not long after finding out about the removal of the Class 40 nameplates, I discovered that the same had been done with the Class 44s. All ten were named shortly after construction, lending the collective nomenclature to the class, but again, someone somewhere in the BR hierarchy deemed it best to remove them en masse. Maybe it’s no big deal, but why do it? What benefits accrued? I would say none, but that’s just my opinion. The disappointment at being too late to see the 40s and 44s with their nameplates in situ did not, nevertheless, prevent a great affection building for them. The consolation was in trying to ‘collect the full set’ of named Class 45s, and in the excitement of seeing for the first time one of the 47s with truly gargantuan plates – ‘Isambard Kingdom Brunel’ and ‘George Jackson Churchward’, their appearance making a day at Sheffield always truly memorable. They were the celebrities of their day. 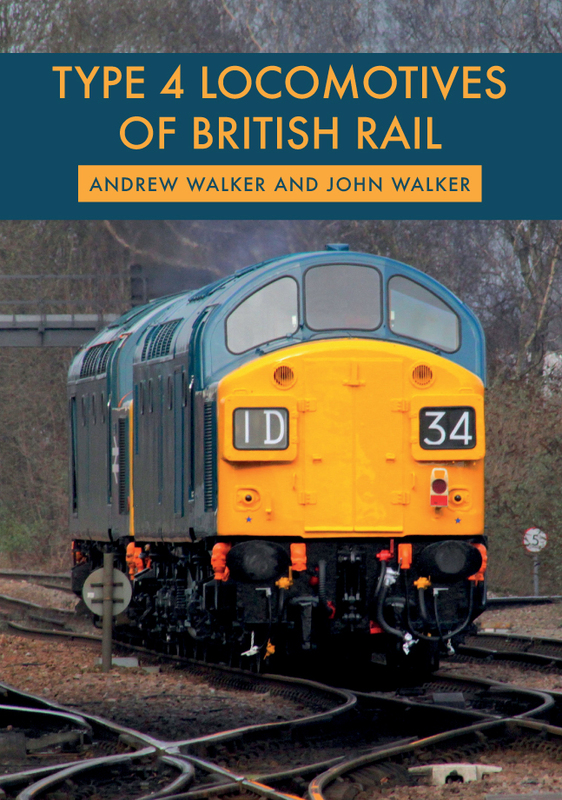 Andrew Walker and John Walker's new book Type 4 Locomotives of British Rail is available for purchase now. This entry was posted in Blog and tagged John Walker, Type 4, British Rail, Type 4 Locomotives, Type 4 Locomotives of British Rail, Andrew Walker, Locomotives, Transport, Amberley Publishing, railways on November 6, 2018 by Amberley Publishing.